Reading Divine Dance: the Trinity and Your Transformation reconnected me with the insightful 20th century Trinity of The Matrix movie when she announced to the chosen, but reluctant Neo that ‘it’s the question driving us’. Like, everyone, he faced the choice of awakening to reality or believing other’s certainties. Reality, says author Richard Rohr, is absolutely relational. 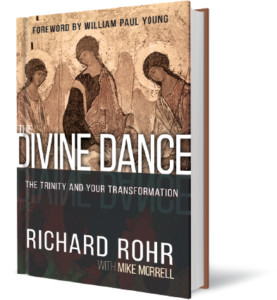 Whilst wondering whether Christianity needs to die, he promotes a Trinitarian Revolution that reveals God as the divine dance of interconnectedness. There is no Critical Spectator here, instead, a participatory, interdependent relational experience. Rohr’s ideas aren’t revolutionary. Indeed, he states his case drawing wisdom from Jewish texts, Hindu theology, Christian mystics and more. He dances us from exhausted theology to a lush garden where mystic possibilities tempt, only to trip us up by stating that we need great love and suffering to keep dancing. It’s incongruous but perhaps that’s the point. Discordant notes and broken heartedness are not what humans yearn for. Being broken and vulnerable irritates. However, limping and suffering is essential to Richard Rohr’s theology of the divine dance that he says is God and ‘not only stranger than we thought but stranger than we’re capable of thinking!’ Like science telling us that empty space has its own energy. Rohr’s theology connects with my work as a spiritual care practitioner. Sitting alongside people trying to make sense of suffering and death in a public hospital can be messy, noisy, interrupted and fragmented. But sometimes all of that chaos falls away and the space between becomes strangely quiet, almost pregnant with an indefinable energy. That no-thing space appears in a compassionate healthcare model developed by Canadian researchers. Patients interviewed said that compassion relied on virtues embodied in the character of healthcare professionals and that one of those virtues was love. What’s more, health care providers need to engage and relate to suffering from a place of shared humanity. Drawn like the heart of a seed, the model highlights the space where there is no-thing but mutual human vulnerability of staggering power. Is this vulnerable, no-thing space how we will speak of the Trinity in the future? Sometimes it seems like that but as Rohr says with his usual deft turn of phrase, ‘metaphors by necessity walk with a limp!’ He’s relentless in the pursuit of change required for Christianity to have any hope of reinvention. Read him for change, not for stability. Sinclair, Shane, Susan McClement, Shelley Raffin-Bouchal, Thomas F. Hack, Neil A. Hagen, Shelagh McConnell, and Harvey Max Chochinov. “Compassion in health care: An empirical model.” Journal of pain and symptom management 51, no. 2 (2016): 193-203.